If you are not familiar with the water bath canning method watch our water bath canning video workshop. Always make sure you are following all safety guidelines outlined by the USDA when canning anything. 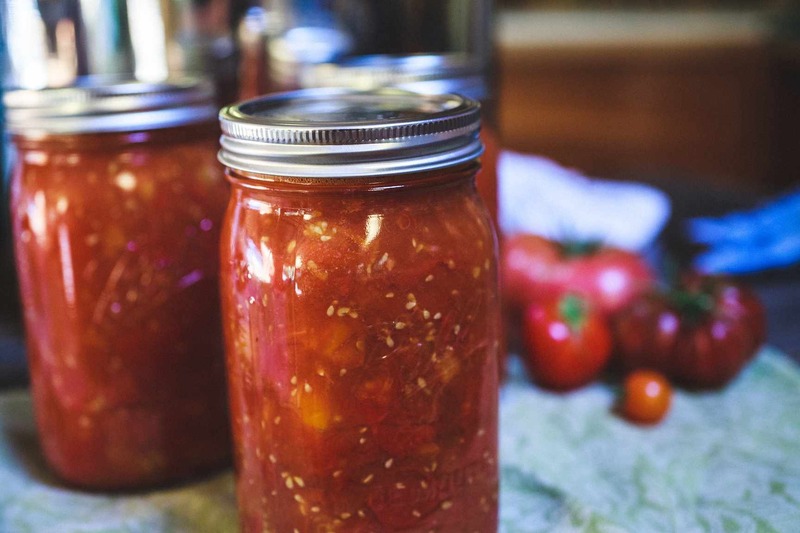 This recipe makes 7 pints of delicious homemade tomatoes using the hot-pack and water bath canning methods. Hot pack is when you place hot food into hot jars before processing - so in this case we'll be packing hot pre-cooked tomatoes into pre-heated jars. Fill your canner 2/3 full of water and start heating it up. Select your best canning jars for the job. The most important thing is that you select jars free of cracks, defects or chips. Wash the jars, lids & bands and all of your tools in hot, soapy water. Sterilize your jars by placing them in the hot canning water for 10 minutes. To sterilize your jars properly, you must have the water above 185° F. Leave your jars in the hot canning water until you are ready to fill them so they remain sterile and hot. Wash your canning jar lids in hot soapy water. Do not boil or cook your lids! Always follow the recipe when canning. If you stray from your recipe, you risk spoiling your food or ending up with an undesirable taste profile. Clean and slice your tomatoes into quarters. Place them in your non-reactive pot and cook on medium low for 20-30 minutes stirring occasionally to avoid burning your sauce on the bottom of the pan. Your tomatoes will get softer and release much of their liquid. Turn off the heat. Scoop your tomatoes and cooking liquid one large spoonful at a time into a food mill. Processing the cooked tomatoes through the food mill will puree the tomatoes and remove the skins and seeds all at the same time. You could pulse the tomatoes in a food processor but large bits of skin and all of the seeds would be incorporated into your final sauce. Both skin and seeds will give it a bitter taste and undesirable texture. Now that you have your strained pulp, transfer it back to your cooking pot and cook over medium-high heat, uncovered. Add the salt to taste. Let your sauce cook until it has thickened and reduced by one-half. Make sure not to wander off. You will need to be stirring the sauce often. Remove the sterilized canning jars from the canning water with your jar lifter and place them on a clean kitchen towel. Add 1/2 tablespoon of bottled lemon juice to each pint jar. Ladle the hot tomato sauce into each jar leaving 1/2" of head space at the top of each jar (headspace is the measurement of space between the lip of the jar to the top of the food or liquid). Run your bubble remover around the inside of the jar to remove any air bubbles from the sauce. Use your magnetic lid lifter to pick up and place clean lids and rings on your jars. Hand tighten them. This recipe calls for a 35 minute processing time in a water bath canner. When your jars are done processing, remove them from the canner with your jar lifter. Place them on a kitchen towel or other buffer so as not to shock the hot jars by placing them on a cold surface. Once you’ve processed your jars and they've cooled down, you’re ready to store them in a cool, dry place until that cozy winter day when you decide to pop a jar open and enjoy that unmistakable taste of summer. I can’t wait! It’s part of our mission here at Mountain Feed to help you make delicious, sustainable, homemade food, more often. Stop by and say hello on Facebook, Twitter, Instagram or Pinterest. Or, as always, you can do it the old fashioned way and come by the store to speak with one of our in-house experts. And of course, we are proud to offer you the best home canning equipment at the best prices in our Home Canning Department. If you are not familiar with the water bath canning method watch our water bath canning video workshop. Always make sure you are following all safety guidelines outlined by the USDA when canning anything. Keeping a great journal leads to delicious results! Get inspired by new recipes, expert articles and homemade food adventures in our Monthly Journal.